[20:31] <+KeithLeiker[TLA]> Hey everyone, my name is Keith Leiker, and I’m a freelance game designer. I’ve worked on a bunch of free to play and mobile games including Marvel Avengers Alliance with Disney. My gaming roots stem from D&D 2e+, action RPG’s, and computer strategy games. My current favorite is Scythe and Stelaris. [19:33] <+WadeDyer> G’day all. My name is Wade Dyer and I’m the creator of the sci-fi RPG: Fragged Empire. I am just now running a Kickstarter for 3 new sourcebooks for 3 new settings. [19:34] <+WadeDyer> Fragged Aeternum (Gothic Horror), Fragged Kingdom (Fantasy Kingdom Building) and Fragged Seas (Pirates and Eldritch Gods). [19:35] <+WadeDyer> Fragged Aeternum is a Soulsborne-styled setting where the PCs are powerful and immortal beings known as the ‘Tethered,’ who fight against even more powerful Fiends and other evil forces in an endless city that stretches out to all corners of known existence. [19:36] <+WadeDyer> Fragged Kingdom is a fantasy themed setting where the PCs will begin to fight back against the wild and reclaim the world for civilisation. What awaits these brave souls is a vast and unexplored land, overgrown, and full of monsters, lost magic and ancient secrets. Fragged Kingdom is also set within the same universe as my sci-fi game: Fragged Empire. [19:31] <+PeterC> Hi, my name is Peter Cakebread and I’m a partner in Cakebread & Walton. 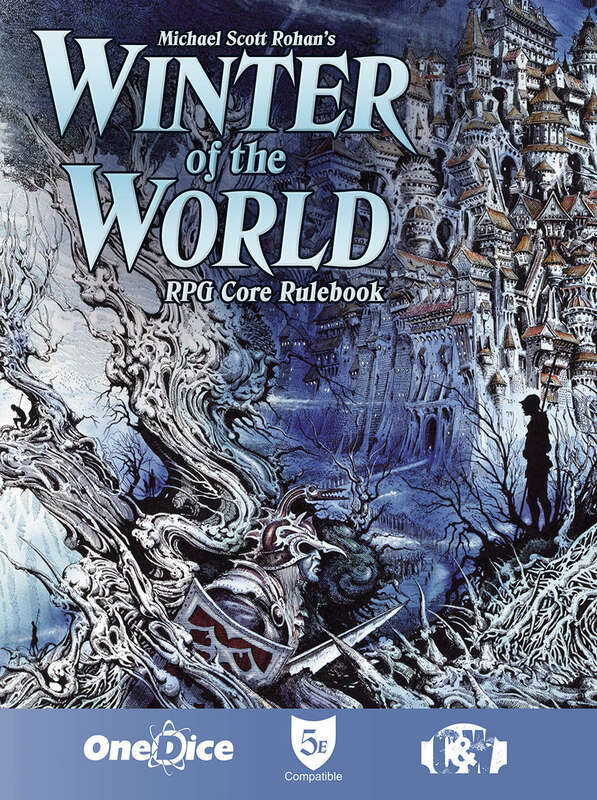 We produce a whole bunch of stuff, including Michael Scott Rohan’s Winter of the World RPG. [19:33] <+RememSean> It’s a tabletop game in the style of Goonies, Gremlins, ET, or Stranger Things. [19:34] <+RememSean> I’m here to answer your questions about whatever! [20:30] <+Juliet> …an ability buy mechanic to give it the flexibility of a point buy system. [20:31] <+Juliet> I began creating this game almost 15 years ago as a creative outlet for my spare time but also because me and my friends at the time needed a gaming system that combined magic and technology and none of us liked the books on the market at the time. And after many years of revisions, testing, editing, it is nearing fruition. [19:25] <+TorgDarrell> Hi everyone. I’m Darrell Hayhurst, one of the designers for Torg Eternity. [19:32] <+greyauthor> Well hello and thanks for having me! I’m Chris Grey author of The Happiest Apocalypse on Earth, which is a tabletop roleplaying game using the Powered by the Apocalypse framework. Have a few days left on the Kickstarter, but I’m funded and rushing toward the next stretch goal! [19:33] <+greyauthor> The game takes place at Mouse Park, which is a theme park taken over by some horrible unspeakable terror. The nature of the terror the table defines and the nature of the park the table defines as well. The Narrator creates incidents that player characters react to and mayhem ensues.